The creators of Don't Dribble On The Dragon are back with their magical show There Was An Old Lady Who Swallowed a Fly, which has been written especially for grown ups to enjoy with their children. Expect a feast of sing along songs, colourful animal characters and heart-warming family enjoyment. Also on at the Waterside, Four Go Wild In Wellies is a whimsical adventure featuring bobble hats, scarves, tents that have a life of their own and, naturally, lots of fun in wellies! What happens when a beatboxer, a singer and a puppeteer arrive on stage but nothing is set for them? No scenery, no instruments, no puppets… no rules. Big Up! is perfect for little people who want to be big, and big people who might be ready for a little reminder of how to play. Various activities take place during the school holidays; under-7s can join a “rocket trip” into space, exploring the solar system and playing lots of games along the way. Meanwhile bigger kids can take part in Telescope Walking Tours, giving you the chance to learn more about how the Grade 1 listed Telescope works, explore its fascinating history and discover some of its ground-breaking research. Activities are FREE with general admission and available between 16 - 22 February. 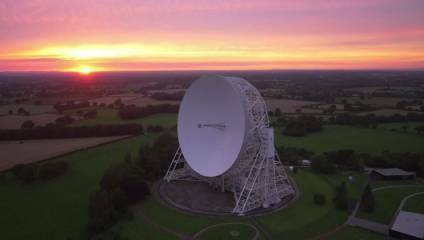 For more information visit the Jodrell Bank website. Kids go FREE before 10.30am at this iconic mini golf course on weekdays from 11th – 22nd February. Discover 18 holes of action-packed adventure golf in a dramatic Jurassic setting next to the M60, featuring moving dinosaurs, a winding river and a waterfall – as well as fascinating facts about the prehistoric period dotted along the way. And if the weather’s bad, you’re only a stone’s throw from the Chill Factore, with its huge array of activities and eateries.